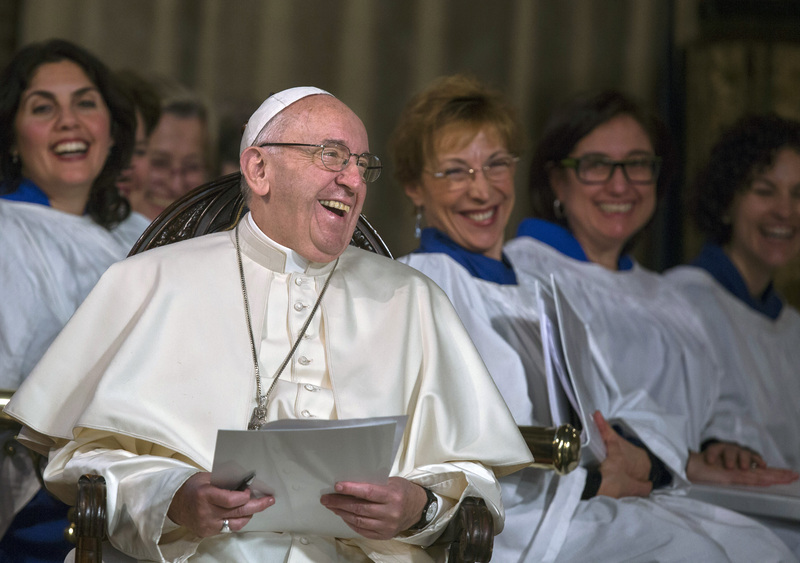 Following the release of “Gaudete et Exsultate,” Pope Francis’ new apostolic exhortation on holiness, America asked several contributors to reflect on the document. “Rejoice and be glad!” is what Jesus said on the Sermon on the Mount. It is also the title of Pope Francis’ new apostolic exhortation on holiness in everyday life. Why should we “rejoice and be glad”? Because God, as Francis reminds us, calls us all to be saints. But how can we respond to that call? You do not need to be a bishop, a priest or a member of a religious order to be holy. That also doesn’t have to mean big, dramatic actions. Francis offers examples of everyday sanctity, like a loving parent raising a child, as well as “small gestures” and sacrifices that one can make, like deciding not to pass on gossip. If you can see your own life as a “mission,” then you soon realize that you can simply be loving and kind to move towards holiness. You also do not have to be “swooning in mystic rapture” to be a saint or walking around with “lowered eyes.” Nor do you have to withdraw from other people. On the other hand, you do not want to be caught up in the “rat race” of rushing from one thing to another. A balance between action and contemplation is essential. —James Martin, S.J. Though other of Pope Francis’ writings and homilies manifest the imprint of his Ignatian spiritual tradition, perhaps none does so in such a striking manner. Francis does not mince words. “The Christian life is a constant battle,” the pope writes. “We need strength and courage to withstand the temptations of the devil and to proclaim the Gospel. This battle is sweet, for it allows us to rejoice each time the Lord triumphs in our lives” (No. 158). Christians ineluctably confront two standards, two ways: the way of Christ, whose apparent darkness is a prelude to eternal light, and the way of the enemy, whose false light leads only to darkness and despair. And our choice is made not once for all but requires daily renewal and recommitment. Hence, according to the pope, the urgent need for discernment. Discernment requires much more than native intelligence or mere common sense. True discernment is a grace. He immediately cuts to the chase: “How can we know if something comes from the Holy Spirit or if it stems from the spirit of the world or the spirit of the devil?” (No. 166). Discernment then is not primarily about the decision to be made. It involves the more difficult and laborious process of discerning what spirit is moving us. Thus discernment requires much more than native intelligence or mere common sense. True discernment is a grace, “a gift which we must implore” (No. 166). For anyone who has spent much time in church communities or even on so-called “Catholic Twitter,” the behaviors of the faithful that Pope Francis describes in “Gaudete et Exsultate” are not unfamiliar. What may not be so familiar, however, is Francis’ description of these tendencies as contemporary manifestations of the ancient heresies of Gnosticism and Pelagianism. What exactly is at stake here and why does Francis devote such a large chapter in “Gaudete et Exsultate”to the dangers posed by these ancient heresies? Why does Francis devote such a large chapter in “Gaudete et Exsultate”to the dangers posed by two ancient heresies? In many ways, Gnosticism and Pelagianism are two sides of the same coin. For contemporary forms of Gnosticism, the temptation is to reduce Christian holiness to a set of abstract ideas detached from the flesh. As “Gaudete et Exsultate”correctly points out, this is somewhat attractive in that a “strict and allegedly pure...[faith] can appear to possess a certain harmony or order that encompasses everything” (No. 38). Ultimately, however, this approach fails to engage the messiness of real life and the fact that God is a mystery that cannot be domesticated or understood easily. There is a deep simplicity at the heart of Pope Francis’ new exhortation: We are called to become more fully who we are, the people of God. The call to holiness is at once personal and communal—pushing us to actively build the kingdom of God. The intimacy of its message is striking. “The important thing,” Pope Francis explains, “is that each believer discern his or her own path, that they bring out the very best of themselves, the most personal gifts God has placed in their hearts” (No. 11). Who is God calling you to be? How is God calling you to holiness? We hear the personal call to holiness in the seemingly mundane reality of our everyday lives, and it is in the simple witness of those everyday relationships, of our “next door neighbors,” in which one is confirmed and strengthened on one’s path (No. 7). But if the call to holiness is deeply personal, it does not come to us in isolation. But if the call to holiness is deeply personal, it does not come to us in isolation. We are called together. This is the central thrust of salvation history; God enters into relationship with the people. This is the radical communitarianism and intimacy of Jesus’ prayer in John 17:21, “that they be one as we are one.” Pope Francis reminds us: “We are never completely ourselves unless we belong to a people. That is why no one is saved alone, as an isolated individual. Francis refrains from offering specific examples, of course, but it is not difficult to imagine what he has in mind. In North America alone, there are many well-funded Catholic sites and numerous Catholic blogs whose aim is often to slander and malign fellow Catholics who, in the eyes of these writers, believe or live the Catholic faith incorrectly. This article also appeared in print, under the headline "Rejoice and Be Glad!," in the April 30, 2018 issue.